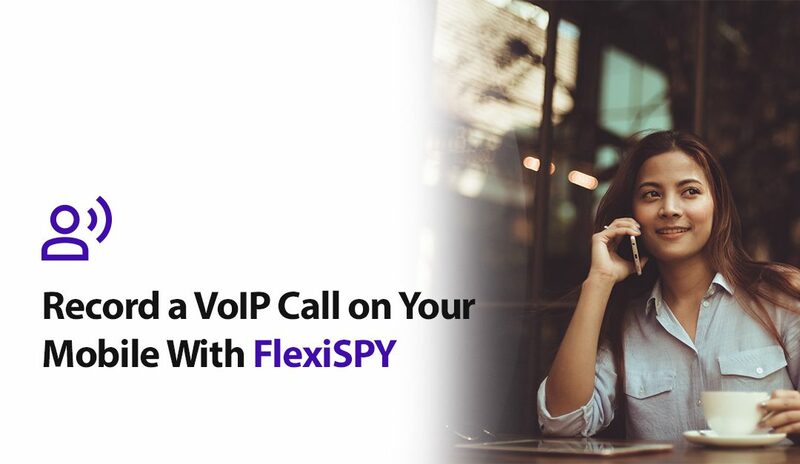 FlexiSPY – the world’s most powerful monitoring software – makes it easy to record calls on the most popular VoIP applications. That means YOU can now record calls made on programs like Skype, Viber, LINE, Whatsapp, Facebook and more! This is the perfect tool for business owners who need to keep track of how their employees are handling confidential information and for parents concerned about their child’s social interactions or decision-making. VoIP stands for Voice over Internet Protocol (VoIP) – and VoIP calls are regular calls between two people that take place over the internet rather than a landline. And with the advent of social media and instant messaging applications, VoIP calls are quickly replacing traditional phone calls around the world. Who can record VoIP calls? Anyone with an internet connection! FlexiSPY Extreme is available for both iPhone and Android users and allows you to record calls on the world’s most popular VoIP applications, including Skype, Viber, LINE, Whatsapp, Facbook, WeChat, Google Hangouts and many more! Easy! Just like with other FlexiSPY features, we keep you in mind and work to ensure it’s as easy-to-use as possible. As soon as the target phone uses any of the many supported programs to make or receive calls, then these calls will be automatically recorded and uploaded to your personal web portal. Here you’ll be able to listen to or to download the recording later for offline listening. You can even listen to the files directly from your phone with our brand new mobile viewer application, FlexiVIEW! Why do I need to record a VoiP call? This feature is perfect for anyone who uses an iPhone or an Android and spends a lot of time on VoIP applications. Recording these calls is extremely useful for parents and employers who are responsible for other individuals, as well as the overall well-being of their families or businesses. Insider threats, security breaches and data theft happen every day – and most employers have no idea until it’s too late. FlexiSPY gives you the power to know if something is happening before it goes too far and allows you step in to rectify a potentially dangerous and costly situation for your business. By recording the VoIP calls of employees using company phones or machines, you will be able to know as soon as something out of the ordinary takes place. In addition, if employees know they are being monitored, they will be more productive and less likely to follow through with any negative actions toward the company. FlexiSPY helps employees understand the value of their jobs and the information they deal with on a daily basis. VoIP call recording can also be used for recording important business phone calls, interviews with potential job candidates and even quality control training! Did you know that 80% of kids and teens check their phones hourly? Are you aware of who they are speaking to or what they are talking about? Now, this is not to say that all kids are up to no good, but rather, it’s easy for kids to get caught up into peer pressure or negative situations. And with technology advancing and kids spending so much time on their phones, it’s really impossible for parents to be watching ALL the time. Nor, should they have to – as trust is a very important part of a child’s development. FlexiSPY, however, gives parents a tool to ensure their children are safe and making responsible decisions when using instant messenger and VoIP applications like Skype, Viber, WeChat, LINE, etc. Think of it as technological babysitter – someone who is there in case anything looks suspicious. We do not encourage parents to spy on everything word that is being said, but knowing whether or not your daughter is really going to her friend’s house after she’s lied before or whether your son is really ‘studying.’ Odds are your kids are telling the truth, but FlexiSPY lets you be there for those times that may push the boundaries a bit too far. VoIP call recording is growing in popularity by the day. Now is the time to protect your family or business – or both! – and invest in monitoring software. FlexiSPY gives you more features – with more being developed every day – to make sure you are always ready to take on the next big issue in your life. For more information on VoIP calls and how FlexiSPY can help you, visit www.flexispy.com.